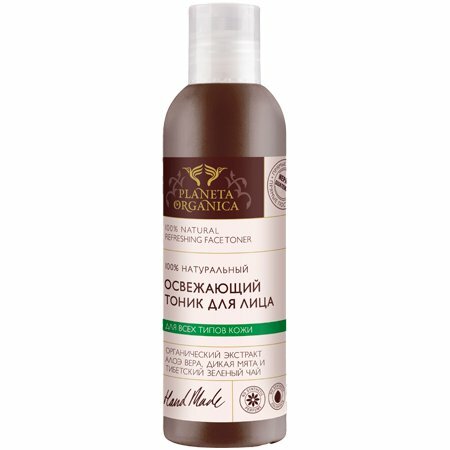 Refreshing Face Toner is produced by the Russian beauty brand Planeta Organica. It is suitable for all skin types. Due to the high content of active ingredients, the product cleanses the skin very delicately yet effectively. It eliminates the signs of stress and fatigue, provides a cooling and refreshing effect, improves skin elasticity. The product contains aloe vera leaf extract enriched with vitamins A, B, C, E, minerals and amino acids. It has a strong antioxidant effect and thus protects the skin against free radicals, stimulates collagen synthesis and skin cell metabolism. Wild mint (pudina) extract restores and maintains skin elasticity, has a toning and refreshing effect. Green tea extract has a strong antibacterial effect. It prevents oily shine and improves complexion. Ingredients. Aqua enriched with Aloe Barbadensis Leaf Extract*, Mentha Arvensis Extract, Camellia Sinensis Leaf Extract*, Nuphar Luteum Root Extract*, Centella Asiatica Extract, Cucumis Sativus (Cucumber) Fruit Extract*, Morinda Citrifolia Leaf Extract, Schizandra Chinensis Fruit Extract, Coffea Arabica (Coffee) Seed Oil*, Ginkgo Biloba Leaf Extract, Plantago Major Leaf Extract, Salvia Officinalis Leaf Water*, Echinacea Purpurea Extract, Epilobium Alpinum Extract, Hyssopus Officinalis Extract, Citrus Medica Limonum Fruit Extract, Vanilla Tahitensis Fruit Extract, Citrus Aurantium Dulcis Peel Oil*, Mentha Piperita Leaf Oil*; Caprylyl/Capryl Wheat Bran/Straw Glycosides, Fusel Wheat Bran/Straw Glycosides, Polyglyceryl-5 Oleate, Sodium Cocoyl Glutamate, Glyceryl Caprylate, Tocopheryl Acetate (vitamin Е), Panthenol (provitamin В5), Sodium Ascorbyl Phosphate (vitamin С), Citric Acid, Benzyl Alcohol NI, Sodium Benzoate NI, Potassium Sorbate NI, Parfum. Want to buy Refreshing Face Toner? Call us or submit your order via our web site!